It’s Paint Party Friday again! I’ve been doing watercolor sketches from life in my sketch journal this week, but I did this one last night from a photo. The photo was one of this week’s WDE offerings at Wetcanvas.com. I just couldn’t resist these guys, so ready to hit the road, but it was late and I only had time for a sketch. It’s about 8″ x 5 1/2″ in my sketchbook. 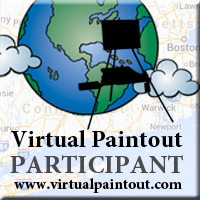 Take the PPF link to see what everyone else has been painting this week! This entry was posted in Arts & Crafts and tagged challenges, sketches on April 8, 2011 by admin. This is fabulous- those smiling faces catching the breeze- I LOVE it! 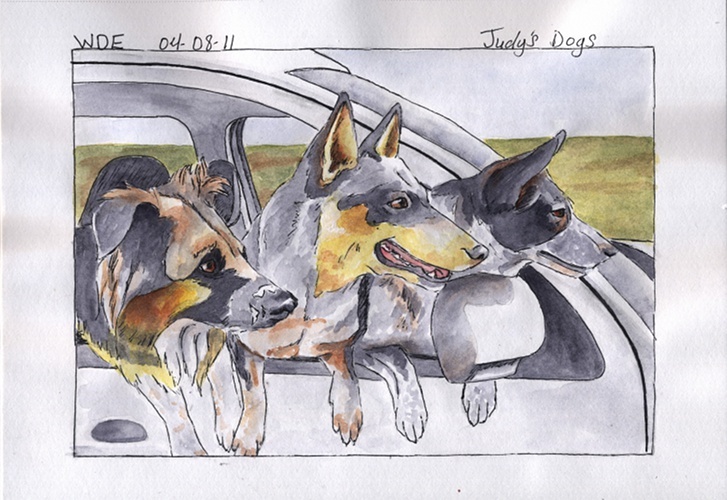 You’ve really captured the essence of “doggie joy-riding”! Excellent faces. I love the way dogs smile. They are happy. Great job. Happy PPF! I love it! They look soooo happy. <3 dogs. And I am a huge fan of watercolor, turned out great! LOVE the pups!!! Great work! Happy PPF! I love this. I love dogs. They look so happy with wind in their ears! very nice work. Funny how they are all three out the window like that! These dogs all have personality! I love it!! The middle one reminds me of my husky, Misty…the restlessness. 🙂 Great work! Thanks for sharing. Greetings, I find it a great job, this is more than a sketch, it could be a work in itself. What a fun, fun, fun painting! I agree that this could be a finished work just as it is! Beautifully done ‘sketch’! I love that you captured their eagerness to go for a car ride! How fun! It brought a smile to my face to see all those happy guys! This is great! You captured the look of happiness my dog gets when she is hanging out the window. This is a beautiful watercolor. Love it. A picture says a thousand words! OMG, you could sell this in a heartbeat!!! Such a fun and pretty picture! Wonderful! I love how you captured their expressions. oh this is amazing….I love it!!! I am enjoying all these visits for PPF!!!! This painting is adorable and full of joy. You’ve captured the dog’s characters and brought the painting to life. You’re so talented!! fabulous, so much life in their faces! Judy’s dogs are lucky charms….all three are so adorable and unique. Our wonderful furry kids! Lovely sketch! What a great painting! I love the subject, the way they are all trying to stick their heads out the window…great job! This is excellent! Did you ever capture these dogs well! Super job! LOVE LOVE LOVE This! the expressions, the movement, their character, you did a great job of capturing it all. Love your watercolor dogs! FUN!!! Oh my gosh! So cute – they look like they are so happy and ready to have some fun. It’s a wonderful piece!